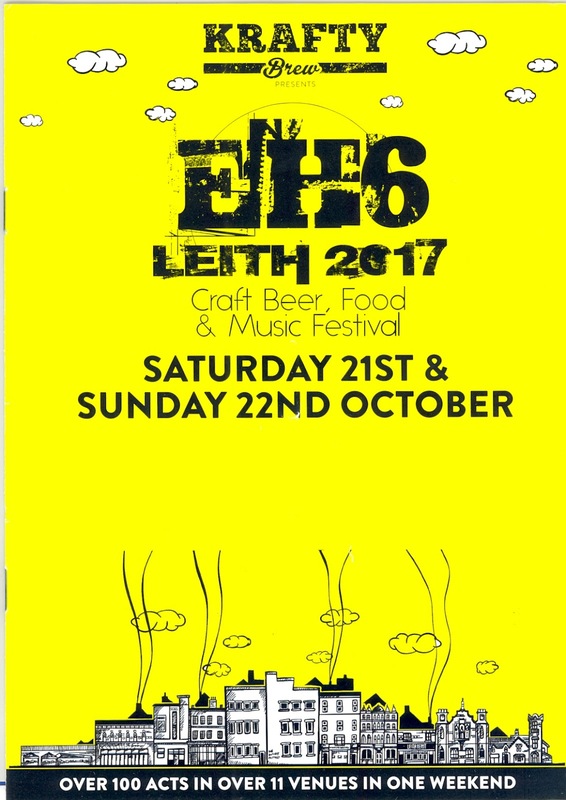 The Krafty Brew EH6 Festival, held in Leith, Edinburgh over the weekend of 21st/22nd of October 2017 billed itself as a "Craft Beer, Food & Music Festival". 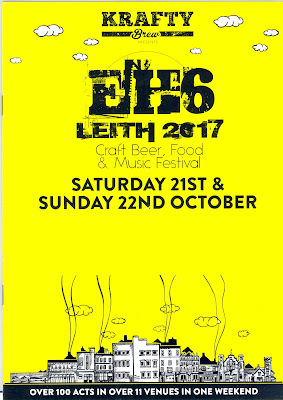 Although, in truth, I would attest it was more of an alcohol and music festival, with a few (upmarket-ish, admittedly) burger vans thrown in. Although, I did, I have to own up, enjoy a Haggis and Brie bap. Which certainly represented a first for myself. But the prime draw for me was, as ever, the music. And I attended for a few hours on the Sunday evening. 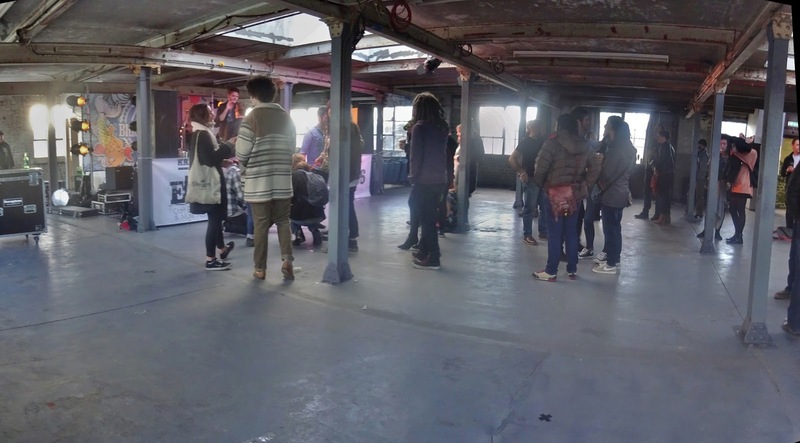 The festival was spread out over nine venues, most sited between Leith Walk and Ferry Road, although I limited myself to the The Biscuit Factory – a bare concrete and girder construct which once housed, as the name suggests a biscuit factory. These days it resembles the sort of place which may have changed hands a dozen or more times during the Battle of Stalingrad. The place housed two stages this evening – one on the ground floor, where the various alcohol stalls were to be found, and another two floors up, labeled the Krafty Brew Stage. The two flights of stairs required to get to the top level clearly represented a step too far from the alcohol for many folks, for the acts on this upper floor often found themselves performing to criminally small audiences . It was to the latter arena I gravitated when I arrived at the venue around 4PM, just in time to catch the last number by a duo by the name of Jacky Sand & The Soul. I assumed Jacky to be the singer, and The Soul to be the hairy chap playing the sawn-off guitar dobro fashion. Their closing tune was a catchy slice of twangy Americana, and made me rather wish I had got there half-an-hour earlier. The Krafty Brew Stage, between acts. The Imagineers were next up - quartet of young pups whose collective age would probably total mine. Their opening two or three songs were fairly inoffensive chunks of Eighties-type Indie – all strummy chords and youthful exhuberance. It was pleasant enough, but hardly ground breaking. The drummer then stepped out from behind his kit and, after a bit of confusion, strapped on an acoustic guitar to perform Black Gathers. This was much better. I really enjoyed this one. The lads' final two songs were each enlivened by one of those things one rarely seems to encounter these days – a guitar solo. Reading the name of the next act – Statler Project - I initially wondered if perchance this was going to be some sort of homage/tribute to The Statler Brothers who had regularly backed Johnny Cash back in the day. I could not have been more wrong, as became evident by the throbbing piece of psychedelic funk with which they opened their set. It truly sounded like a chunk of noise which had been absentmindedly left off Space Ritual, and I almost expected singer Bob Speirs to begin warning us all about the dangers from sonic attack. Everything was propelled along by Stewart Tees' rumbling bass guitar which had my testicles throbbing and tingling away rather pleasantly. Even though they were fronted by a chap sporting the silliest haircut/facial hair combo I have seen for some time, I just thought they were great. My only criticism? The songs were too short. Each one really really deserved at least a fifteen minute slot to themselves, to allow the groove to flow and evolve. Space Rock's not dead. It was then back downstairs to catch the end of the set by the oddly titled Pronto Mama, a Glasgow outfit. What a striking-looking bunch they were: one of the singers looked about 12, whist the other could have been his Dad. They employed a trombone/trumpet horn section and had a drummer displaying quite the most impressive tonsorial structure ever seen outside of The Muppet Show. Their music was a complex collection of odd time signatures, the stuff probably requiring a few exposures to, to fully appreciate. I enjoyed their song Arabesque immensely. Sinderins were one of the bands I had specifically come along to see this evening (I was missing a family dinner out, and had not made myself at all popular). I cannot be cool about Sinderins. I think they are absolutely wonderful; a triptych of talented singer/songwriters each bringing their own particular style to the party. What’s not to love? Blue Rose Code's Ross Wilson is a busy man these days, out and about promoting the imminent release of his fourth studio album The Water of Leith, although his short set here drew upon all of his previous output. The first three songs suffered a touch from poor sound, I felt, but Mr. Mix must have got things right by the time of Scotland, Yet for this rendition was pretty special. Another set highlight was On the Shore, a song I am learning to love the more I hear it. The intensity of trumpet player Colin Steele's work on this one represented the evening's zenith for me (after the haggis bap). At one point I thought he was either going to physically raise the roof on the old building with his playing, or pop his prostate in the attempt. Thankfully neither catastrophe came to pass. 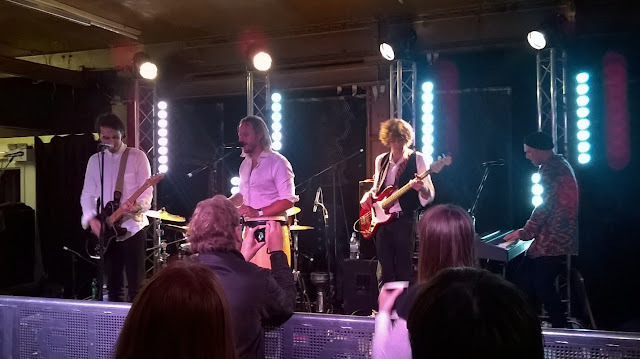 What is rapidly becoming the band's Smoke on the Water, Edina was then performed to the evident delight of the the locals, before the most enjoyable set closed with a bluesy rendition of Grateful. “Every time I cried changing nappies in the morning” does not have quite the same ring to it. As soon as BRC were finished I scurried back down the stairs to catch Space – the borderline Brit pop band from Liverpool who had enjoyed a couple of hits back in the Nineties. Most memorably with Female of the Species. And I was more than a little taken aback to find the downstairs venue packed to the proverbial gunnels. There only appear to be three Space these days, with front man Tommy Scott having somehow in the interim taken on some Carlos Santana / Kid Creole / Fedora-toting spiv persona. But the band could still play a bit, and even their new single, the salsa-tinged Dangerous Day, sounded, Hey dangerously good. On the subject of danger, I began to pick up the vibe that rather a large number of the attendees at the show had probably now been drinking for the better part of eight hours. And there was just that slightly disconcerting hint of menace in the air. I could well have been proved wrong, but I could not help but feel a few hazardous-to-innocent-bystanders scuffles were probably in the post. So I decided to give the rest of the bands a miss and head off home. And anyway I had already seen headliners Big Country once before – thirty three years ago.